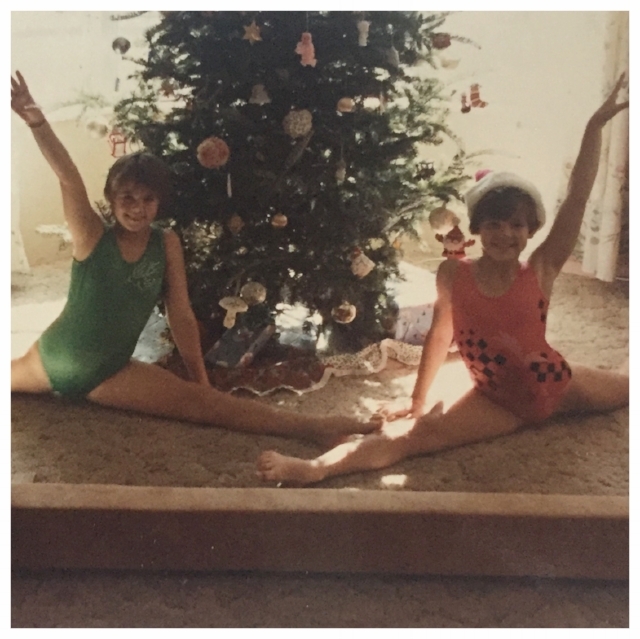 Three decades later, two best friends attempt to recreate this Christmas photo with 25 days of Christmas Splits. It’s going to take a Christmas miracle. In effort to finish the year strong, and help motivate anyone needing a push, Erika (my childhood bestie) and, are going to recreate this photo. Yup. Splits-fest! We are implementing our own, 25 Day Christmas Splits Challenge. It’s been more than three decades and trust me, it will take a Christmas miracle, but it’s a good excuse for us to get together and “practice” and get me out of my damn chair! As the final month of the year, it feels only right to pay tribute to December as the “home stretch”. With a whole month left till the end of 2018, we still have time to make good on whatever promises we made back in January. Now, four weeks is a good amount of time. It’s not a lot of time but it’s a reasonable chunk and if you apply yourself, you could probably see progress in whatever your goal. Every year Erika and I say we are going to recreate this shot and every year passes without any effort. Well, not this year! Crunch time is upon us and tis the freakin’ season! And, if you read yesterday’s post then you know I’ve been extra sedentary lately. It’s now or never folks. This has to happen. Normally, I’m not one to promote fitness during the holidays (or vacations). No use in missing out on the glorious goodies this time of year brings. My approach typically is to go all in. I eat everything, lounge endlessly watching Christmas movies, and bask in the decadent joy of the season. By the time New Year’s comes along, I’m saddled with plenty of motivation to make a fresh start. Well, I guess you could say Christmas came early? I am so desperate for a change of pace that cookies and glogg are of little interest. See?! I told you! Something is wrong!!! I’m hoping the infusion of extra movement will have me back to my old self lickety-split. I need an injection of holiday cheer ASAP, and I figure the best way to achieve that right now is with a healthy intention. A flexibility goal seems like a perfect step towards feeling better. Not to mention, flexibility is easily practiced at home which is a must for the caregiver lifestyle. And the good news is we’ll be sharing snippets of progress with you along the way. How’s that for joy? Nothing like awkward internet photos to help spread some holiday cheer, am I right? It’s like the a horrible version of an advent calendar but we’re going for it! It can’t be any worse than coal. And thank gawd Harry Cline offered us those yoga suggestions with his guest post yesterday cause we are gonna need them! You can follow along via the Stories section of the How to Feed a Senior, Instagram account but don’t judge cause we’ve got that covered. This photo alone has me zeroing in on my sweet haircut and my graceful claw. For all the haters when it comes to aging, I think this photo is proof that things get better with time. Clearly, the years have been kind and I’m hoping this also applies to the next 25 days. Keep your finger’s crossed for a Christmas miracle folks, and let me know if your up for the challenge or doing one of your own! Group accountability always helps. Speaking of Christmas, I created a holiday gift guide for foodies if any of you are in search of ideas. I have two more in the works for both caregivers and spoon carvers which I’ll post when they are ready. Complete this sentence: "When I grow old I...". It's common to hear "When I grow-up I..." but when was the last time you heard someone talk about their desires for old age. When was the last time you looked far enough into the future so you could see past retirement. I want to know about that version of you. More importantly I want to know more about that version of myself. So, instead of some goals for 2017 I'm setting them for 2047. Let's tack on 30 years and make a daydream for that person. When I grow old I'll have long white hair like my mom did. I will live in a rural, small cabin with a small footprint with my love who looks as handsome as the day we met even with the wrinkles. I will be a master gardener and a bee keeper. I will be able to get up off the ground without help and still split my own wood for the oven. The house will smell of fresh bread and the hours will pass with hobbies and craft that reflect a skill that can only be acquired with practice and time. I will have learned patience. I'll be both flexible and strong for my age. I won't be on any medications and I will cook for my friends. I'll take outdoor showers, make up my own sacred rituals, and connect more to the earth than ever before as it will await to receive me in rest.